Wonki Ware’s handmade pottery has found broad commercial appeal with customers all over the world. 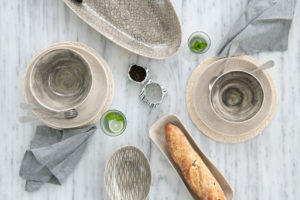 From weeknight casseroles to holiday feasts, neutral dinner services to artful place settings, its tableware is versatile and unfussy (not to mention durable). It’s all down to founder Di Marshall’s people-centred approach to running her studio. Each piece passes through 18 pairs of hands from start to finish to ensure a unique, sophisticated product. We asked Di how she developed Wonki Ware into an internationally recognised brand. You have a team of 70 people producing work in your studio. Tell us how Wonki Ware started? I live in a small town called George along the Garden Route in South Africa. I started a small studio in the town centre in 1999 purely to keep myself occupied while my children where at school. We lived on a farm at the time and had to travel quite a distance every day so I thought it would be good idea to work in my pottery studio in the morning, collect my children and go back to the farm in the afternoon. I happily started working and slowly attracted the attention of the local community. Before long my little studio became a meeting place for other potters and people that enjoyed being creative. About the same time, a young Xhosa man named Atwell started arriving every morning looking for work. I did not have much money at this stage to pay him, but he was willing to do anything, so I started teaching him about clay. To our delight he started producing very sensitively worked platters and bowls. I began developing patterns that were relatively easy to reproduce but at the same capturing a sensitivity in pattern and design. Another person that became invaluable to our team walked into the studio one day and painted a plate – and I knew instantly she had to join our team. Les, Atwell and I became a formidable pottery team. Our energy and enthusiasm had people from all over the country popping in to buy our pottery. The word had spread from Cape Town to Johannesburg and before long we had orders that we could not keep up with. So many brands have struggled to make craft commercially viable. What’s your secret? I devised a method where I made the original shapes and trained my staff to duplicate from them. I also began developing patterns that were relatively easy and simple to reproduce. Our skilled potters are now training newcomers in the art of making Wonki Ware and I feel confident that this is being achieved successfully. It is with pleasure and pride that I feel I can hand over this side of the business to my employees. What are you most proud of with regard to your expansion into the international market? We are sold in 14 countries, by the leading retailers around the world. Our manufacture has tripled, and the high point is that it has become a recognisable brand world-wide. Most homeware buyers are aware of us. Why do you think Wonki Ware has such wide appeal to different kinds of customers across the world? It is a robust, tactile product, and the design and patterning is fairly simple and therefore easy on the senses. It is neither over-styled nor under-styled. This balance gives it the ‘wow’ factor that has mass appeal. We have harnessed the science behind the product, where we have mastered the appeal to a mass audience. Wonki Ware has a star-studded list of customers. Can you drop a few names for us? Nigella Lawson, Jamie Oliver, Tina Turner, George Michael, the Swedish Royal Family, Bollywood stars, Cindy Crawford, to name a few… Wonki Ware has also been featured in various box office movies such as Me Before You and is often used on the Cooking Channel’s Siba’s Table and various local TV shows. 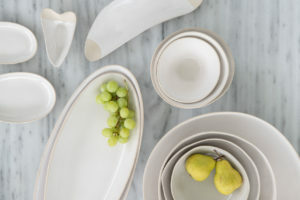 Ceramic trends come and go. How do you stay relevant and in demand? We have created a classic product that is timeless and vibrant. Developing our variety of shapes and patterns has given us the opportunity to be ahead of most trends, especially with colour.